Is there a more quixiotic place in superhero fandom than the Captain Marvel message board at dccomics.com? Earnest fans trade detailed essays on "Making Captain Marvel Popular Again", post angry tirades about DC's supposed conspiracy to marginalize the character, relish and debate brief guest appearances in other heroes' comics, even launch discussions of different artists' renditions of the character's vambrances (the yellow/golden bracers on Cap's forearms.) Cloth or metal, where do you stand? Really, this is no different than any other fan message board--except all of this activity is for a character who more or less faded out in 1955, sued out of existence (and later bought by) Superman's publishers. Despite the similarity to so many other chat boards about equally trival pop culture, the place is positively haunted by a pronounced sense of people desperately passing the time until they are overtaken by sweet, sweet death. Maybe I'm being a bit harsh. Like many people my age, my first exposure to Captain Marvel came with the terrible CBS Saturday morning series (Winnebago, Mentor, a production budget envious of Dr. Who)--and with DC's first misguided attempt at reviving the character for the comics. Even as a little kid I thought the Shazam comic was at best okay, with appealing art by the likes of Kurt Schaffenburger, but with limp stories that seemed intended for an audience that even then no longer existed. I can't tell you word one about the comic shown here, my first issue. The costume color reversal is striking, and the cover sells the book. But it was clear from the interiors that DC just didn't know what to do with Captain Marvel. The stories typically came off as insincere or half-hearted approximations of the surface naivete of Otto Binder's light, comedic Golden Age Cap strips. Beck, associated with the revival in its early issues, quickly walked out over the poor quality of the scripts. 30 years later, DC still hasn't figured it out. And I don't think they ever will. Because their marketing imperative, to keep the trademark viable for movie options, merchandise, comics, etc., will always run up against the fact that this is simply a dead character, unworkable outside his orignal context. Captain Marvel, like Jack Cole's Plastic Man, Jack Kirby's New Gods, Will Eisner's Spirit and a few other properties, is the superhero equivalent of John Travolta in The Boy In the Plastic Bubble. Outside his original protective environment he chokes and dies. Every time DC puts him on that horse to ride free and feel the wind on his cheeks, he's going to expire. In part, this is because Captain Marvel's original, massive success is tied so closely to the distinctive cartoonish style of original Cap artist C.C. Beck and his studio. All other modern verisions either seem off-model or slavishly imitative, and in either case pointless. Plastic Man and Kirby's Fourth World suffer from the same problem; subsequent artists, toiling in the long shadows of the original creators, try to navigate the impossible path between redundant (John Byrne on anything originated by Jack Kirby after X-Men) and wrong (Grant Morrison's Jim Carreyesque Plastic Man). The original Captain Marvel also exhibited a guilelessness common to family entertainment of the 1940s and 50s which is unthinkable today. In some ways Beck and Binder's Captain Marvel talked down to its intended audience much as a strip like Owly does today--a condescending adult's conception of what a kid should like. Of course, Captain Marvel sold over a million copies every three weeks at its 40s peak, so maybe Beck and Binder were onto something. In any event, time and talent are not all that stands in the way of a successful Captain Marvel relaunch. Unlike the other superheroes who survived the 1940s, and all those who came later Captain Marvel as an idea uniquely depends on an audience comprised--if not exclusively, at least mainly--of children. That's because the wish fulfillment of the character, worn on his vambrance, is one of a little kid magically granted an adult's assumed power to right wrongs and affect his environment. When you've got a bunch of kids reading that, no problem. But kids don't read superhero comics anymore. Adult men do. And that means the central fantasy of Captain Marvel gets flipped on its head, in a manner decidedly unflattering to the reader. Instead of a boy who miraculously becomes an adult, Captain Marvel is inescapably an adult frame hiding the innocent, helpless boy inside. Which is how many aging comic book fans undoubtedly see themselves. The other option for adult readers is to envision Captain Marvel as a stonger, more competent version of their ineffecttual adult selves. Both readings trade in pathos. After trying and failing to ape Beck and Binder for a few years, DC tried an approach that married goofy, Golden Age plotting with slightly deeper characterizations and detailed art by Don Newton. This version ran as a back-up strip in an anthology, and is (along with the Joe Staton-drawn Plastic Man of the same era) probably the most successful shot at Captain Marvel. Unfortunately, in today's marketplace anthologies and back-up strips, a natural home for a semi-retired character with limited potential, are also dead. Since then, DC has tried to graft various levels of "realism" onto the Big Red Cheese, all of them miserable failures. It always feels like a zombie shuffling around in a Captain Marvel suit, a sad display of Captain Marvel-like chin-jutting, arm-waving and noise-making cloaking a hidden desire to eat the reader's brain. The most recent low point, courtesy of Geoff Johns, involved a realistically-drawn Captain Marvel being lectured by the old men of the Justice Society for becoming romantically involved with a young teenage girl...because they don't realize he's just a teenager too, underneath his big hairy flesh suit! Exploring a case of mistaken pedophilia is something nobody needed to see from Captain Marvel, but is the logical outcome of forcing a square superhero into a pseudo-psychologically "real" hole. And if that sounds dirty to you, you shouldn't be reading Captain Marvel comics. Jeff Smith, creator of the independent comic Bone, is currently at work on a Captain Marvel mini-series for later this year. If anyone can pull off a decent Captain Marvel story mixing whimsy with a modern sensibility, it's him. But just like Darwyn Cooke on The Spirit, it seems like a waste of talent. The only Captain Marvel comic that I read was the crossover with Starman in the 5th or 6th Starman trade, by Dan Jurgens I believe. It was written much like I imagine his Golden Age comic would be. Captain Marvel would work as a cartoon. Kids would be stoked on a little kid that becomes as strong as Superman and fights giant robots and what not. But yeah, the comic version of Captain Marvel? Seems pretty dead. I thought James Robinson wrote Captain Marvel oddly in that Starman issue, like a stupid, impetuous little kid. 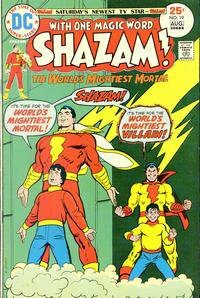 (Billy Batson was always a pretty level-headed kid, able to hold down a job as a crusading radio reporter and afford an apartment when most kids his age were still sucking their mother's dicks, to paraphrase MCA.) Nobody writes the character well anymore, but every modern writer seems to get it wrong in his own way. Back in the 40s and 50s, Captain Marvel (just like the original Plastic Man, who was the straight man in his own strip) was usually in control of the situation--he did have the wisdom of Solomon working for him, after all. He was painfully naive, but since he operated in a cartoon world, this wasn't much of a liability. The only time his composure cracked was when women hit on him. Wisdom, even that of the gods, is useless when it comes to women. To deal smoothly with chicks he would have needed the Confidence of Clooney, but then his magic word would have been SCHAZAM, which just doesn't sing. And yes, a cartoon series would be perfect for Captain Marvel. That's where the character's natural audience is today--camped out in front of Cartoon Network. Part of your post begs the question, what does the C.O. think of how the New Gods are being used in Morrison's Seven Soldiers? Your public clamors for your answer! It's like covering or remixing a song. To be worthwhile it has to be completely different in a way that makes total sense, *and* enjoyable on its own terms--a hard trick to pull off. Morrison has come closer than most to producing successful cover versions of Kirby. The jury's still out on Mister Miracle--right now it's shaping up as perhaps the weakest of the mini-series--but Morrison did a very smart thing by re-imagining the New Gods as actual gods who appear in new aspects among mortals. If Morrison is rehashing the same ground as Kirby, he's done a very good job of disguising it, of manipulating it to serve his own thematic ends. Byrne, for instance, insists on keeping his Kirby homages in a kind of thematic stasis--his revivals always self-consciously, overtly stick to the same themes Kirby covered, the same way Kirby covered them. Morrison isn't afraid to recontextualize earlier creators' ideas, to actually move the ideas forward. His X-Men is a perfect example of reinventing a property to address contemporary concerns, and Mr. Miracle--all of Seven Soldiers, really, is in the same mode. I think this willingness to look past the original trappings honors the spirit of Kirby's creativity far better than the soulless, dimwitted knock-offs produced by most others who misuse Kirby's ideas without adding anything. Morrison also seems to understand the over-the-top peculiarity of Kirby's writing style, evoking it without parodying it. Earlier, Morrison had mixed results using the New Gods characters in JLA--I thought Rock of Ages was perhaps the best multi-issue super-hero story ever, with an effective use of Darkseid. On the other hand, I never thought Morrison got the hang of Orion, portraying him as a slobbering mad dog warrior, whereas Kirby, never a master of subtlety, actually created a far more nuanced character than that. But JLA was about one-note characterization, to make room for the cosmic plotting, so this is a minor sin. I mentioned it briefly in the post, but one of the biggest problems with revivals of the New Gods, Plastic Man and similar properties is that so much of their success is due to the individual talents of particular creators. They were highly artistically personal strips from master cartoonists. Without their input, the strips seem lost. Dr. Strange has meandered around the racks on and off aimlessly for 40 years since Ditko finished saying what he had to say, and all those subsequent issues don't add up to that initial three-year burst of creativity. Superman and Batman were taken over by large stables of interchangable artists early on, serving to lessen the importance of the original creators. Cancellations and long stretches of publishing inactivity shared by all these concepts also serve to weld them to the past and make them harder to revive. But the companies who own the trademarks are compelled to keep them active, and to try to make money from them, (not to mention it's always easier to repackage an old idea than come up with a new one) so we get an endless stream of unneccesary comics. Jeez, Cole, I've been waiting for about four years for you to revisit this topic! Only because I agree so much with what you've said; there are perhaps some characters who simply no longer work in today's climate. The biggest guns lke Superman, Batman and Spider-Man seem to exist in comics form only to fuel their profitablilty in movies and related merchandising while those comics interpreations sink ever deeper in a morass of unheroic and inbred storytelling. Captain Marvel, in particular, seems to have become a reminder of an outdated time that today's fanboys cannot relate to. Rather than see him subjected to more demeaning, hollow non-entertainments, I'm at the point where I really would prefer to let him go. I also see your point on the "Spirit" revival; as much as I admire Darwyn Cooke's talent and temperment, I'm afraid the Spirit is such a personal creation, that a new version will turn out to be all for naught. Four years? Makes me wish I had something new and improved to say about the topic. Instead, it's just been a few more years of comics that tend to confirm my thinking. 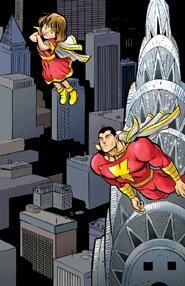 I'm actually enjoying the current Shazam/Superman miniseries, mostly thanks to the nice art and diminished expectations, but I don't think anyone can expect much more from Captain Marvel in the direct market. If Superman struggles in this environment, then a character that has been reduced to a Superman clone (by having his executional uniqueness stripped away in order to fit the tone of DC's "universe") can't possibly fare much better. I'm going to be first in line for Cooke's Spirit, simply because I'm in awe of his chops, but it drives me nuts that he put off a creator-owned project to do this. He's hidden behind King Faraday and Batman long enough, and I want to see if he has anything purely of his own to say. Thanks for stopping by the Mountain. This whole topic makes me think of Alred - Madman seems to successfully integrate the naive enthusiasm of old, great comics while somehow integrating the "gritty" elements that are apparently required to sell comics now. Cole, when you loaned me all the Madman stuff to read I was really floored that someone managed to put together a new character that had a strange golden-age feel without feeling like a Roy Thomas archeological expedition/story. I was kind of bummed when he started doing x-force (although those comics were super fun to read) because Alred seemed to be on a track to create an entire new viable, salable universe that maybe would even be able to support/accept the input of other creators. I've often wondered how Madman might have performed under the banner of a Marvel or DC--but I think ultimately the book "suffers" from the wonderful whimsy that has hampered Plastic Man and Captain Marvel in the direct market. for a couple of decades, superhero fans have been comprised overwhelmingly of those who take their caped wonders "seriously" and demand the kind of heightened, romanticized brutality and cruelty that passes for "realism" in contemporary pop culture. Creatively, I think Allred's Madman is the most significant, visually iconic new superhero of the past 20 years. I hope that Allred gets his Comic Book of Mormon done relatively soon, and gets back to his best character. By the way, Allred has shown willingness to open madman up to other creators--he keeps saying that his friend, film director Robert Rodriguez, is slated to write a madman mini-series if and when the guy ever gets around to making a Madman movie--which I would much rather see than another Sin City.